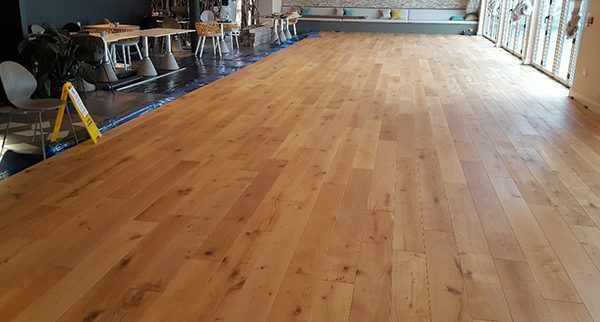 When the Una Pizza Restaurant in St Ives, Cornwall, required a new wood floor it was vital that the premises were only closed for the shortest possible time. By using InstaLay the installation was significantly faster than it would have been with traditional methods and other important benefits were also provided. The InstaLay 25hg was simply loose laid over the existing vinyl floor, avoiding any sub-floor preparation, damage to the vinyl flooring or the use of messy wet adhesives. The 200m 2 (2,152 sq.ft.) of Rustic Oak engineered wood flooring, from V4, was then installed quickly and easily. The new flooring boards (1900 x 190 x 21mm) were positioned in place and the release film pulled from under the planks to expose InstaLay’s adhesive membrane. The planks were then secured by applying pressure to fully activate the adhesive. This created an enhanced floating floor by fully bonding the entire underside of the floor together, reducing reflected walking sound and creating a quiet and pleasant dining environment. There was also underfloor heating within the sub-floor so InstaLay, with its low thermal resistance was ideal, allowing good thermal transmission and ensuring economical heating of the restaurant. The owners were delighted with the speed of installation and the look and feel of the finished floor. It ensures good thermal transmission of underfloor heating.